Three hundred sheets of ordinary typewriter5 paper, more or less like that on which I am writing this note. Please send these things all in one package, by parcel post, not registered, and then I will not have to go to the customs office, which is at the other end of the Island2. The World6 is coming regularly now,7 thanks to your kind intervention. Everything here is lovely now. 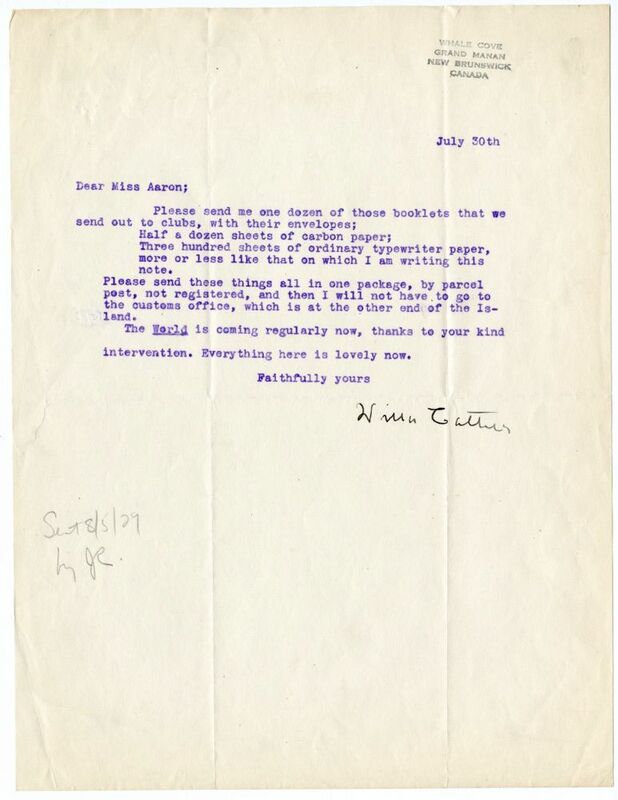 Faithfully yours Willa Cather Sent 8/5/29. This is Cather's first type-written letter from Grand Manan. She and Edith Lewis were spending their first summer in their new summer cottage, and Cather was able to bring a typewriter and leave it from year to year.